After a hard week at work, your feet deserve a spa day. The beauty experts at Treuvís Eyes Nails Body Laser Spa in Clinton Township, Michigan, offer many special pedicure treats for your feet that will make you feel good on the inside and out. To schedule your pedicure, call the office today or book an appointment online. Note: It's suggested to NOT to shave your legs 24 hours prior to any pedicure services. A pedicure at Treuvís Eyes Nails Body Laser Spa is a personalized experience that makes you feel completely and utterly pampered. Your pedicure serves as a stress reliever for both you and your feet and includes a luxurious soak, relaxing leg and foot massage, shaping and trimming of your nails, and a hot towel. And finally, polish to finish your look. Note: It’s suggested NOT to shave your legs 24 hours prior to your pedicure service. With the elegant pedicure, you can enjoy a two-step foot bath that begins with a soak in a fragrant whirlpool bath. Your specialist then invigorates your feet with a gentle scrub, which is followed by nail shaping and trimming and cuticle and callus care. Your specialist then wraps your feet in hot towels to relax the muscles, which is followed by a luxurious moisturizing lotion massage. Finally, your toes are finished with your polish of choice. During your luxury pedicure, you enjoy a relaxing two-step foot bath in a fragrant whirlpool soak, followed by expert nail trimming and shaping with callus and cuticle care. Your relaxation continues with an aromatic sugar scrub. Then, you’re treated with a foot and leg hot towel wrap, and afterward, a luxurious moisturizing massage of your feet and calves. Your luxury pedicure is complete after your toenails are painted with your polish of choice. The platinum pedicure is also referred to as the Spa Staycation and includes a complimentary glass of wine. Your experience begins with a fragrant whirlpool soak, then a nail trimming and shaping, and treatment of your cuticles and calluses. Then your feet and legs are exfoliated with an aromatic sugar scrub, followed by a foot and leg hot towel wrap. Then, to help you feel as relaxed and stress-free as possible, your specialist massages your tired muscles with a hot stone organic coconut oil from the tip of your toes to just below your knee. You’ll feel renewed and remarkable after your second hot towel wrap and a moisturizing massage, followed by the painting of your toes with your favorite polish. To keep your feet healthy and callus free, the nail specialists at Treuvís Eyes Nails Body Laser Spa recommend you come in for one of the luxurious pedicures at least once a month. But you may want to come in more often. 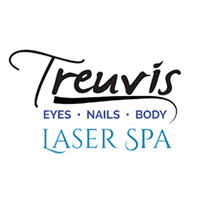 To schedule your pedicure at Treuvís Eyes Nails Body Laser Spa, call the office today or book online.